Far Infrared light is light energy that can actually be absorbed by the body, unlike ultraviolet light. This allows for a completely safe warming sensation without any risk of burning. At a wavelength of 4-14 microns, FIR is a safe, warming heat that can be therapeutic to the mind and body. This “healing heat” reaches to the inner center of one’s self, deep into the bone marrow, resulting in the miraculous soothing and healing feeling one experiences after only 8 minutes in the sauna. It may not be made out of pretty wood, but what makes a FIR Sauna so effective is the generator of the FIR Light that interacts and pulsates your water molecules, creating an increase in core temperature, an increase in circulation, and an increase in lymph flow. If you have all these, then it is incredible to see the health benefits a person can derive. Many health problems simply disappear! . 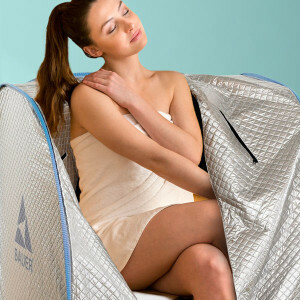 The Relax Sauna is the ONLY portable model that uses the same technology as the Sky Eye Radiator which is certified by the FDA to be a medical device. Of course, all great products have imitators. People love the Relax Sauna because it generates WARM HEALING LIGHT. And it does this very efficiently in only 15-20 minutes! How Does the Relax FIR Sauna Stack Up to Others? The Relax Sauna radiator is the most advanced of any FIR Light generator, and generates the purest, cleanest, most intense soothing light of any FIR Sauna that we have encountered. The Sit-Up version of the Relax Sauna uses 1500 watts of energy, and generates a very intense healing light energy. It has a computer-programmed ceramic semi-conductor chip that filters out all NON-healing energies and a reflecting tent that penetrates deep into human tissues over and over and over again. Unlike a tanning bed, the Relax Sauna will NEVER burn the skin. However, the FIR heat will open the pores in the skin and provoke the body to sweat out waste and toxins. The profuse sweating that results from the FIR Sauna allows your body to breathe again. Toxins and harmful chemicals harbored in your body are released. These are allowed to accumulate because of free radicals such as insecticides and antibiotics. 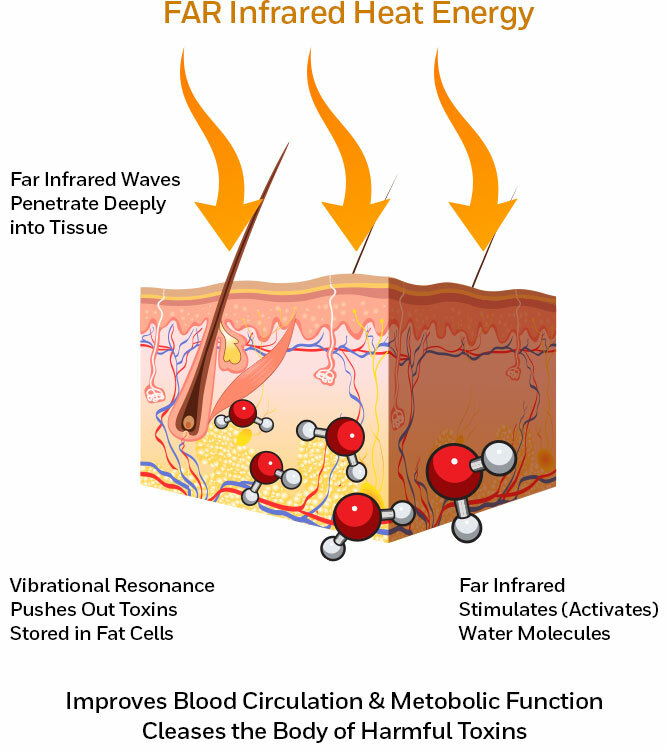 Through perspiration, you can improve the functioning of your cells while increasing your metabolism. Chronic diseases are not only those adversely affecting the functioning body itself, but the mind as well. Depression and anxiety are the most common, but not the only, psychological hindrances that plague millions of people everyday. Once you experience the healing heat of the FIR Sauna, you will immediately feel at peace. With a biological release of harmful chemicals and toxins, your mind will also feel a release of stressors and other events causing emotional or physical hardships. While sitting, you are surrounded by a Cloth Cover embedded with Silver which has a reflecting quality, ensuring that you will be receive a thorough and even absorption of FIR Energy. 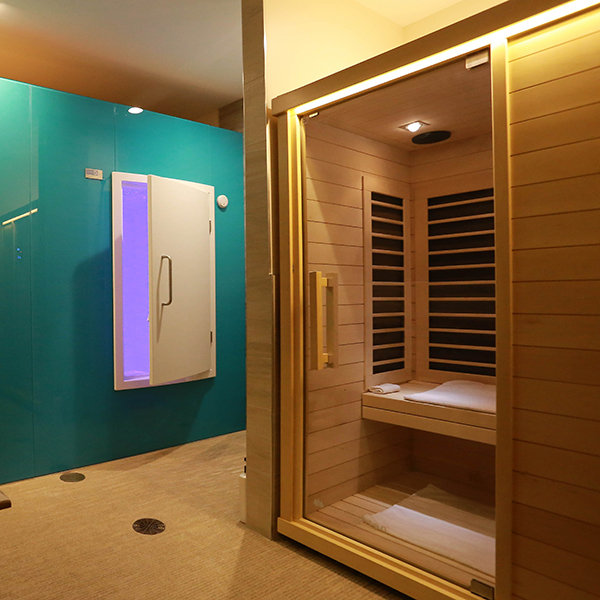 Energy is passed through a ceramic semiconductor that allows relaxing energy to be passed into the sauna. There is no effort required of you, the sauna produces a comforting experience while the FIR Energy works on your body to release toxins, speed up metabolism for increased weight loss, prevent abnormal cell production, and alleviate pain. Because the sauna uses Far Infrared light which is readily absorbed by your body, there is no risk of burns; it is 100% safe. With the FIR Sauna, you will be able to relax and escape, while healing your body from the inside, out. Download a our new FIR Sauna brochure. A very informative and useful guide that provides detailed information on FIR Sauna and answers questions you may have.